Who was the first Israeli to return to Hebron in 1967? The Moslems in control of the building refused to permit Jews into the Cave of the Machpela. Jews were allowed to pray outside, at the infamous “7th step”, but anyone attempting to get any closer to the entrance was beaten by the Arab guards stationed there. Rabbi Goren was present with Israeli forces as the IDF conquered the Western Wall in Jerusalem. 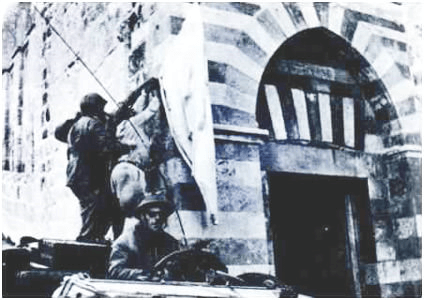 Holding the rank of general, Rabbi Goren knew that the army’s next mission was Hebron. Wanting to be among the first Israeli’s in the ancient City of the Patriarchs, he joined the armed forces stationed at the recently captured Etzion Block, on their way to Hebron. On the night of 28 Iyyar, before retiring for the evening, he requested to be awoken when the soldiers began their march to Hebron the following day. The next morning he awoke, only to find himself alone with his driver. Realizing that he had been “left behind,” he ordered his driver to begin the 20 minute journey to Hebron, expecting to meet the rest of the army, already on their way. Rabbi Goren thought it peculiar that he hadn’t encountered any other Israeli soldiers on the road as he reached Hebron. He thought to himself surely the Israelis had already finished the job of marching on Hebron already. Driving into Hebron, Rabbi Goren was greeted by the sight of white sheets, hung from roof-tops and windows, throughout the city. He was astounded, but understood. In the summer of 1929, Arab residents of Hebron had massacred 67 Jews and wounded many others. 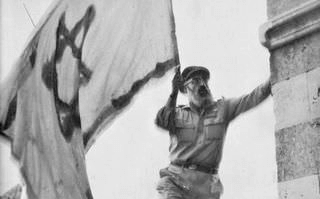 The 1967 Arabs of Hebron were, very plainly, scared of Jewish retaliation. So, they did not fire one shot. Instead they hung white sheets from windows and roof-tops. Only afterwards did Rabbi Goren discover that when he left the base at the Etzion Block, the rest of the forces were on the other side of the hill, making plans for the attack on Hebron. They did not know that the Arabs would surrender. In other words, Rabbi Goren, a single Israeli soldier, single-handedly conquered a city of 80,000 Arabs. Jews had returned to Hebron and to Ma’arat HaMachpela! Dayan sent an officer into Hebron to remove the flag and Torah. On the way back to Jerusalem, the officer was killed in an automobile accident. Dayan then rescinded his order to remove shoes in the Ma’ara.